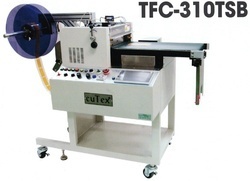 Widest range of all fields cutting machines offering the finest quality and highest efficiencies competitive price, compact design, multi-functional operation and the quickest after-sale service. 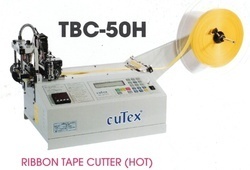 With button switching you can cut strip tapes automatically and neatly. Strip labels with max. 90mm wide can be cut at a range of 15mm ~ 300meter long. 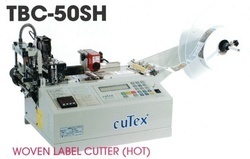 By ultrasonic you can cut and strip labels automatically and softly. Strip labels with max. 47mm wide can be cut at a range of 20mm ~ 135mm long. 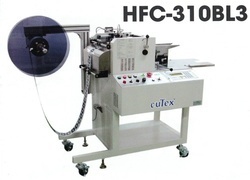 Soft melting and automatic folding & stacking of woven label by a full set of pre-feeder, mark sensor, ultrasonic device, folder and stacker. 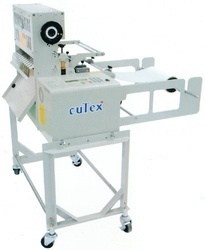 With button-switching printed label will be cut and stacked automatically and neatly. Strip-labels with max. 70mm wide can be fold at a range of 50mm ~ 85mm long. 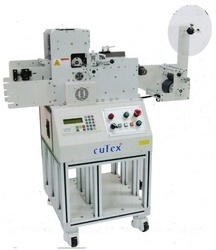 With button-switching label will be cut and stacked automatically and neatly. Strip-labels with max. 80mm wide can be cut & stacked at a range of 30mm ~ 150mm long. 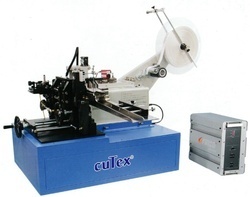 Automatic print marking & cutting label or ribbon. 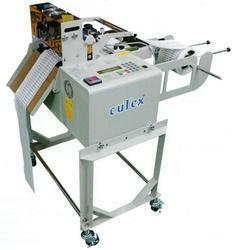 Woven label will be cut & stacked automatically and neatly. Strip-labels with max. 55mm wide can be cut & stacked at 50mm ~ 145mm long. 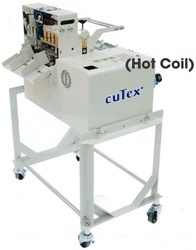 Automatic cutting of tubular knitwear with an almighty winding roller and a special feeding bar which stops automatically in jamming. 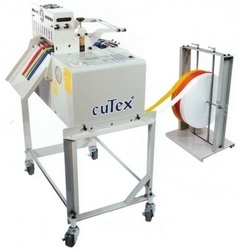 By ultrasonic you can cut strip labels automatically and softly. Strip labels with max. 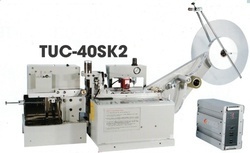 47mm wide can be cut at a range of 1mm ~ 300 meter long. 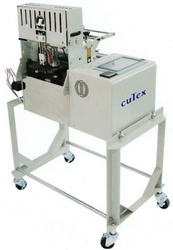 With button-switching printed label will be cut automatically and neatly. With button switching woven label will be cut and stacked automatically and neatly. Strip labels with max. 70mm wide can be fold at a range of 50mm ~ 85mm long. With button switching you can cut strip labels automatically and neatly. Strip labels with max. 90mm wide can be cut at a range of 15mm ~ 300mm long. 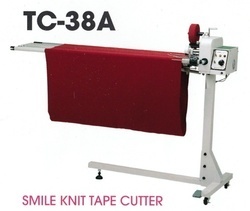 Useful for cutting large and wide materials. 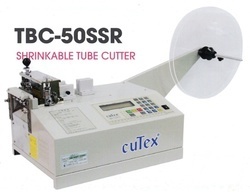 If you need larger cutter please contact us. You can cut angular ribbon automatically and neatly. 50mm width knife rotates by pneumatic system. You can set angle by manual. With anti-static electricity device (option) you can work without problem caused by static electricity. 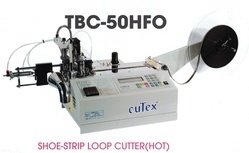 Exclusive use for shoe-strip loop with an automatic operation of cutting. In cutting elastic band being fed from box or ground. 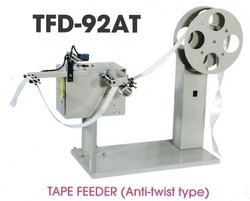 It prevents band from twisting. 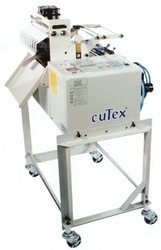 Automatic webbing angle cutter with touch screen. Available point marking and hole punching. Edge round car seat belt cutting with nice sealing. With button switching you can cut vertical blind with making a press mark and slitting automatically and neatly. 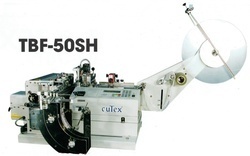 Available for a consecutive work of folding, slitting, punching & cutting automatically with higher speed. 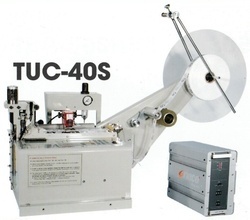 Available for a consecutive work of folding, slitting, punching & cutting automatically. With button switching you can cut tube automatically and neatly. Tube with max. 9mm wide can be cut at a range of 1mm ~ 300meter long. By using shiftable knife device, you can use all range of blade. With button switching, you can cut tube automatically and neatly. 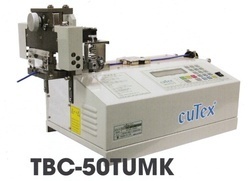 TBC-630TU can cut max. 22mm diameter at a range of 1mm ~ 300meter length. 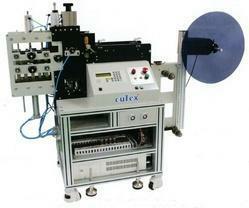 Cut length is accurate owing to using a specific type of sensor by this reason machine can cut many kinds of film. 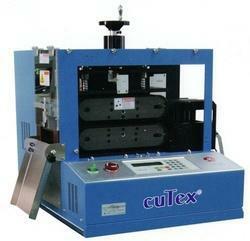 By using inter locking device, it can work with high speed press machine, thompson machine and etc. It's easy to operate by using high class of touch screen. 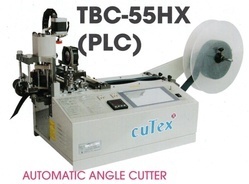 Cut length is accurate owing to using a specific type of sensor by this reason, machine can cut many kinds of film by using inter locking device. 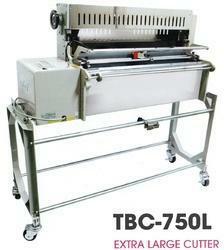 It can work with high speed press machine, thompson machine and etc. Max. width is about 310mm. Multiple cutting at a time. Lower knife plate moves by motor. 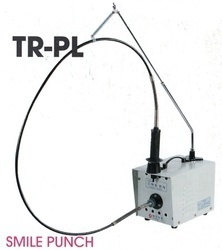 Available to adjust cutting (dwell) time from 0.3sec to 1.6sec by pneumatic system. Lower knife plate moves by pneumatic system.